While this is pretty much analytical, based on visual/dialogue clues from the anime, you’ll notice as you read along that at some moments it reaches a bifurcation on the figurative road representing this thought process. At these times -I will point it out- the choice of a path is based only on my personal interpretation. Thus, can be incorrect. it is clear for me that the story takes place in what today is Japan’s territory. 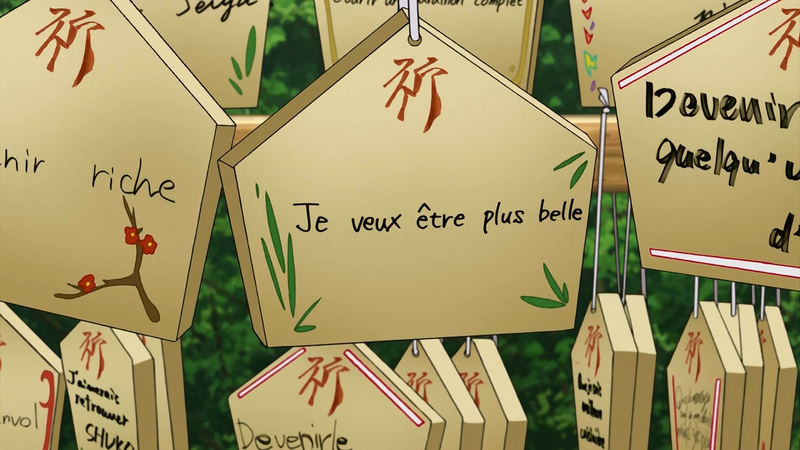 Paying closer attention, it’s easy to notice this was hinted a couple of times and finally confirmed by the OVA (ep. 13) and some of the stronger clues are the remaining structures of the civilization “pre-apocalypse”. 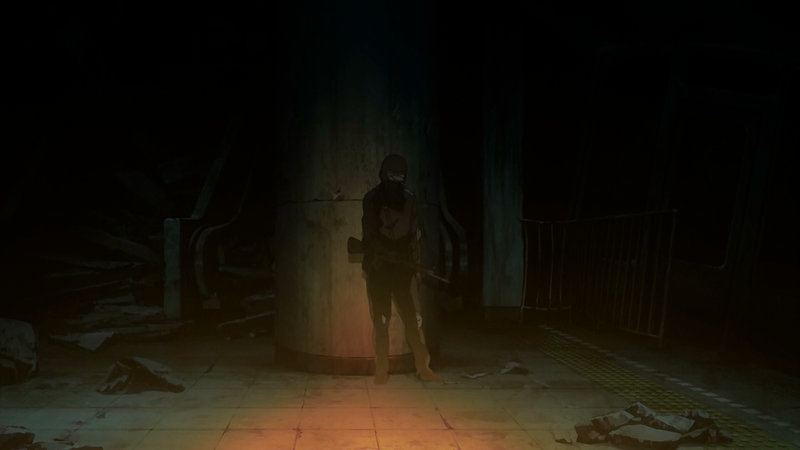 During Filicia’s flashback of the battle she lost her squad, she fells on a subway-like installation and meets with the soldier from the former age. The underground was clearly untouched since the apocalypse, given not only that the soldier’s body wasn’t removed but also considering the technology of the buildings displayed so far, it’s highly unlikable they’d have underground trains. The soldier’s last words are in kanji and lying next to him is a Howa Type 89 assault rifle, standard of JSDF. Another strong evidence are the old, but still operational, observation points the girls check on episode 5. 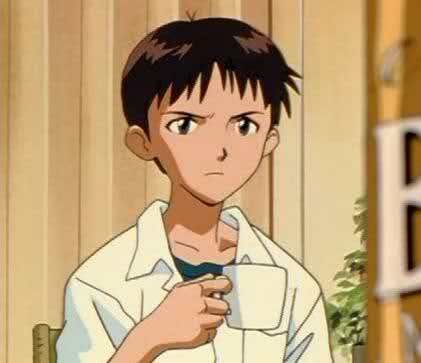 When Kanata touches one of them, it displays a hologram interface that once again is in kanji. Finally the OVA confirms it with the World Map the Roman forces put together. 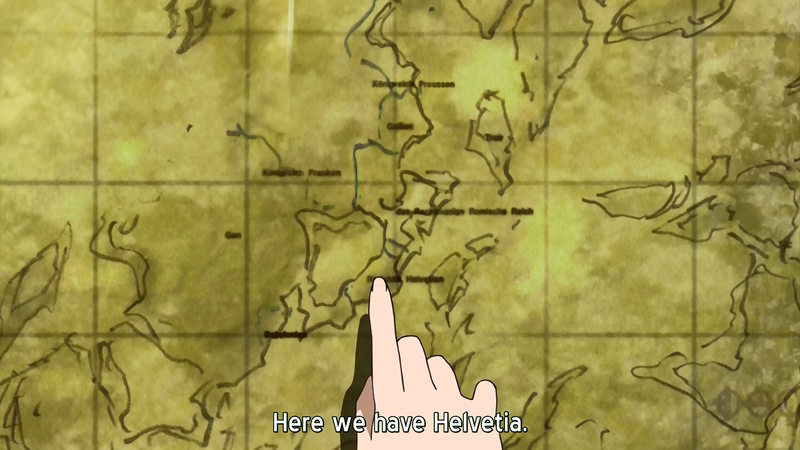 From that we can see that Helvetia embraces the southern half of the Japanese islands and Roma the northern. The other nations mentioned on that episode would be on what today is China, Korea and another seems to be in the middle of the Pacific, suggesting that the Oceans were probably affected as well. I also believe the Sea of Japan is now a region under desertification. 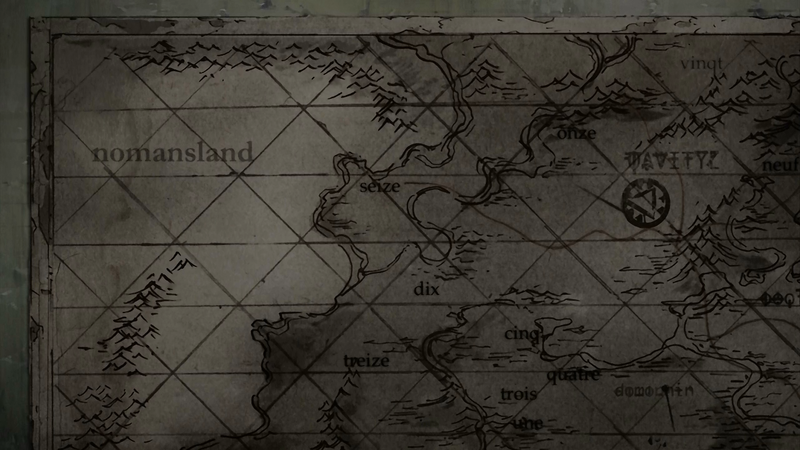 Not only by the outlines on this map but also the one displayed on episode 2. You can see the same symbols used for mountains on land where it was supposed to be water and it’s also labeled as one of the many “No Man’s Land”. When the angels/demons/things of DOOM landed and the War of the “apocalypse” happened, the majority of the Eurasian super-continent (Africa, Europe, Asia) became impossible to be populated. 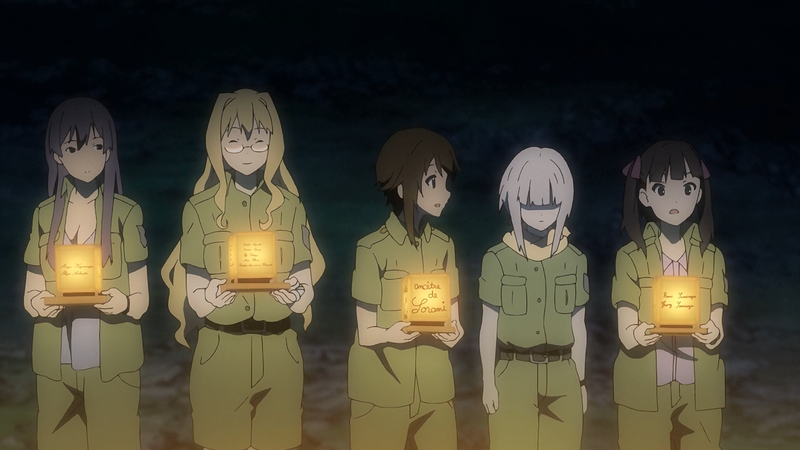 The remaining survivors migrated for the region of what today is Japan, the only territory which wasn’t destroyed by the war -the legend of the fire maidens links here- and started rebuilding the civilization. Now here comes an interesting point. An explanation for this is that those who immigrated from devastated lands, started rebuilding modern civilization and used landmarks from their old homes as inspiration or a way to keep tradition alive. It’s an captivating notion… but easy to prove wrong. In my view, all those mixed locations and architecture inspiration were just the Art Staff messing around with cool backgrounds and settings for their series. If you work with real locations and tell viewers you are indeed working with real locations (i.e: Aria, Tari Tari) comes a need to take extra attention to the job being done, as it needs to be faithful to the original place. On the other hand, if you simply use those locations as inspiration and don’t openly say they are real, you earn a lot of time that would be wasted on brainstorming for settings/backgrounds. 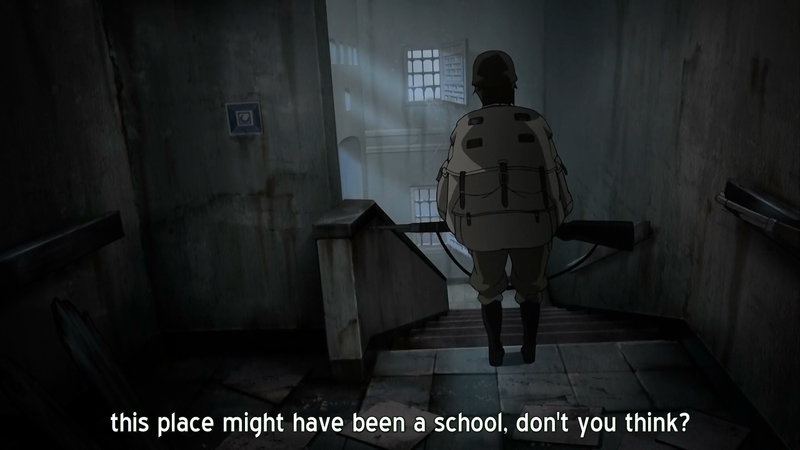 During episode 2, when Kanata and Kureha are assigned to search for the “ghost” they saw earlier, they adventure on the unused side of the outpost and find out that it used to be a school. A school that was clearly a Japanese school. 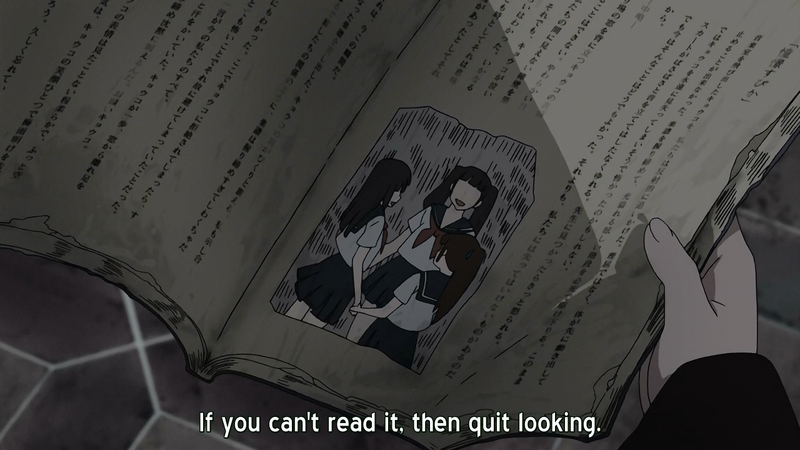 Kanata finds a diary-like book with girls in Japanese uniforms but it is also (again) in kanji. 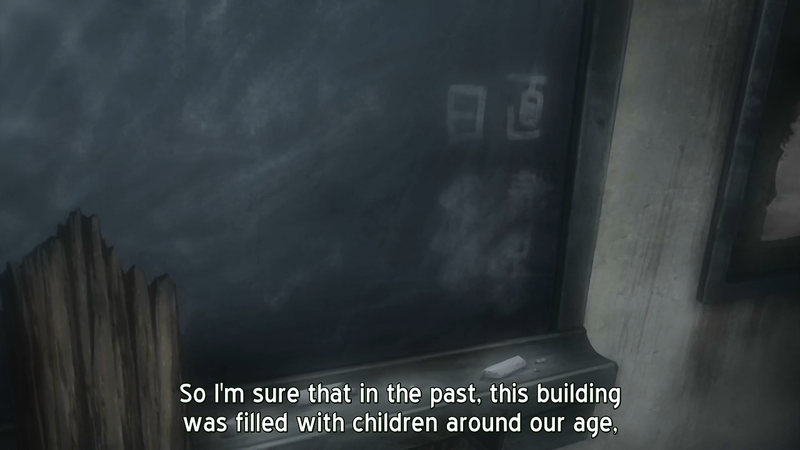 Kureha later mentions “Not even schools in the capital are this big” implying it’s a building from a time prior the war. If we consider the war against the Romans, then the explanation “immigrants build it resembling their homeland” is possible. However, in Ep. 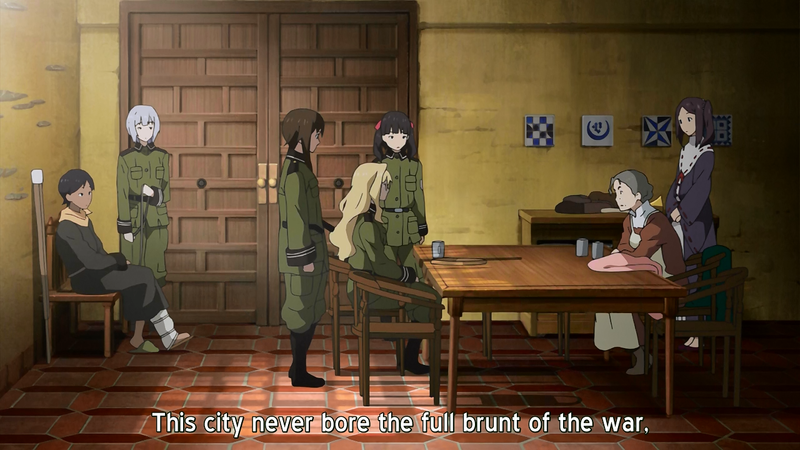 11, Naomi-san mentions the city was never affected by the war. 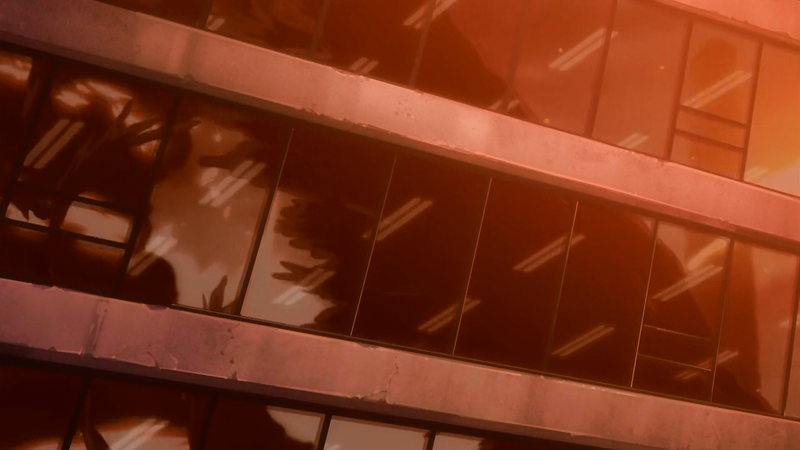 Which leads to the inevitable conclusion that the building was partially destroyed and left in that state from the “apocalypse war”, proving it was a local construction and that its European design is an artistic choice by the art crew, not a symbolism for the story. Still, the immigration aspect is an instigating one. If you consider the name of the girls, “Filicia Heideman” doesn’t sound Japanese at all. “Noël Kannagi” seems like a mixture but “Kanata Sorami” sounds pretty legit. 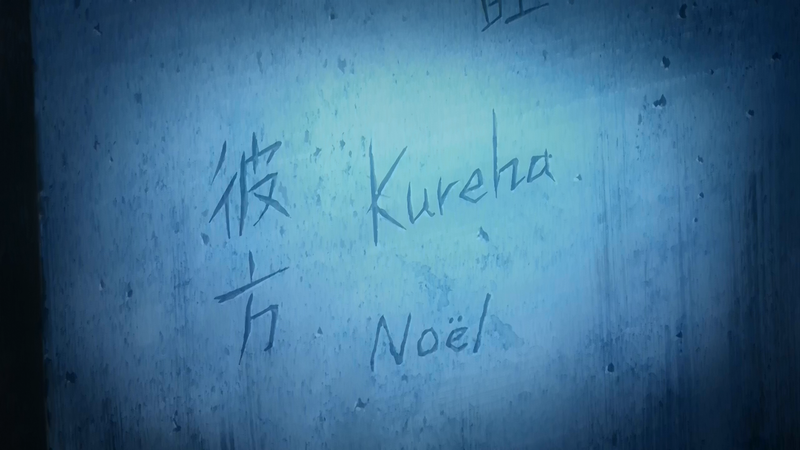 Note how Kanata writes her name in kanji (彼方), something every Japanese kid is taught to do. 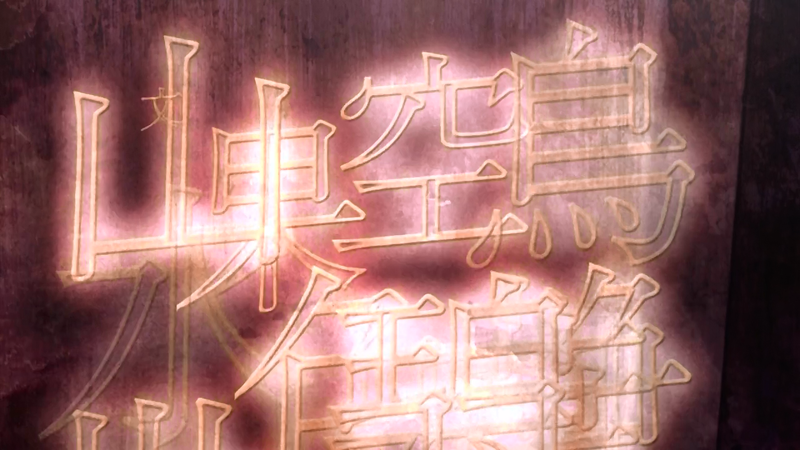 So even if she doesn’t know how to read full sentences, being able to write her name in ideograms, proves her lineage. This leads me to conclude that the other girls are likely descendants from migrants that came from all over Asia/Europe and kind of explains why none of them can read said ideograms. “But they are all speaking Japanese, aren’t them! ?” is a question that I eventually stumbled upon. If you pay attention, whenever a character refers to the language they speak, they call it “Helvetian”. Which seems to be a mixture of French and some other European languages. This is evident when it comes down to writing, city/place’s names and when the main cast tried to interrogate Aisha (who speaks German, by the way). 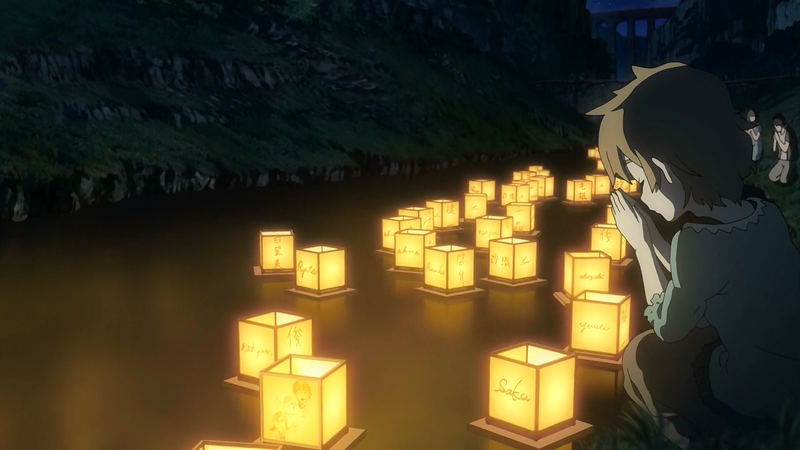 Note how all of the girls’ lanterns are written in the Roman alphabet, but you can still see some with kanji floating on the water. Finally, the anime leaves opened the question of “what” exactly caused the first war which destroyed the world as we know –with a bit of more advanced technology. 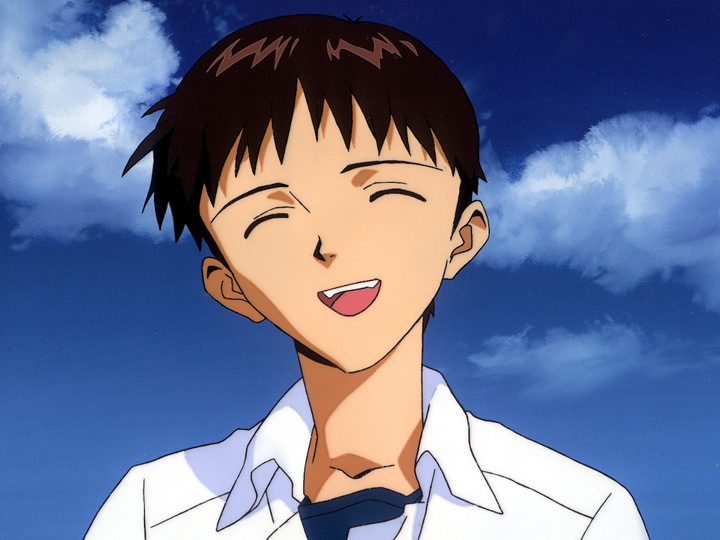 And with that, it also leaves open the question of why was Japan spared from destruction? These three questions are connected and the answers can change depending on how you interpret the legend. I can see two possible interpretations for it. A literal and a metaphorical. The metaphorical is simple. The advances in technology eventually led to a new World War, however this time with advanced weaponry. Society went to ruin by itself. See: It is the nature of intelligent life to destroy itself theories. Some regions of Japan possibly stayed unaffected by the war and eventually survivals migrated there. A certain group of maidens helped those survivors but were branded traitors because of it and then executed. Hence, the legend in memory of them. The golden horn is a metaphorical description of the eventual peace discussions that succeeded, or nations finally realizing what the war has done to the world. 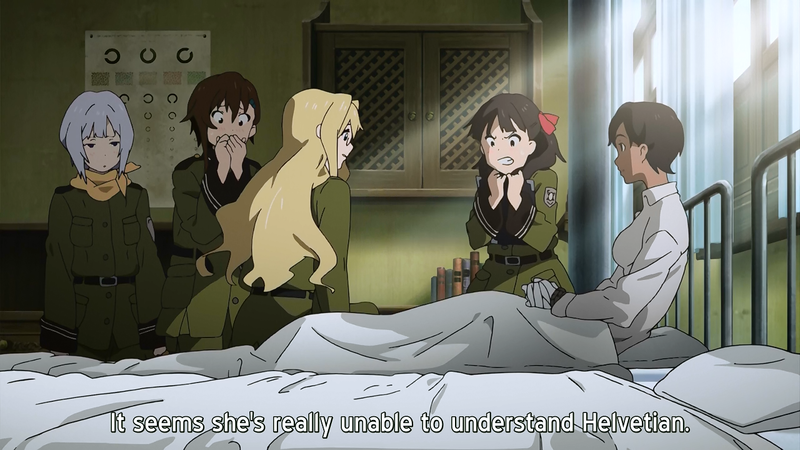 On the other hand, the literal observation seems to be the more accurate if we consider what’s shown on the anime. 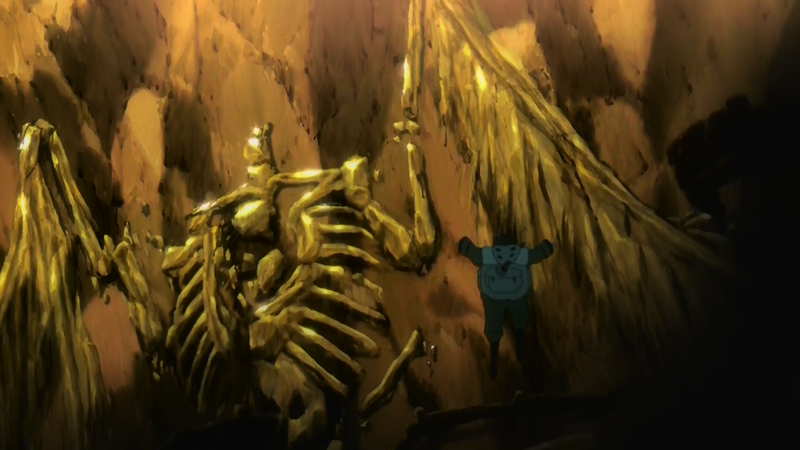 Right on episode 1, Kanata falls on a lake and see the skeleton of a huge creature with bones resembling wings. Later during Filicia’s conversation with the JSDF soldier, we see a wing-like shadow blowing up a city and its defending forces. They are pretty much spoon-feeding us that there was indeed some sort of “being”. What is left for us to wonder is if it was Alien, divine, demonic or man-made. When we associate the idea of the Golden Horn given to the maidens with this being, and considering both tales are related to some religious orientation, the notion that the winged-being was actually a Angel gets a backup. One who read the Book of Revelation will recall the Seven Trumpets and how it’s one of them that puts an end to the apocalyptic events. Obviously, in the biblical passage, when the 7th trumpet is sounded, life on Earth is gone, but here it takes a different path. While the ending sounds quite bittersweet, there’s a brighter side to it many end up missing. When Rio discloses her plan to build an aircraft and fly with it, she mentions she’d like to see the rest of the world. What if there are also arable lands on the Americas? What if the western society also managed to survive and even rediscover more of the lost technology? 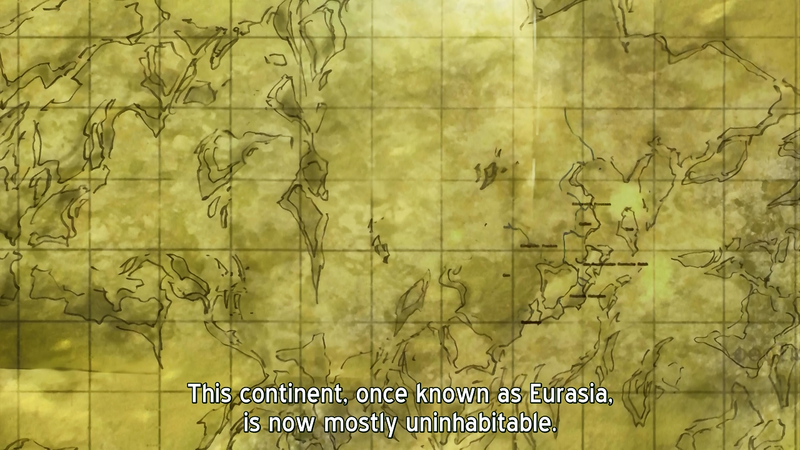 Note how they only mention Eurasia, and that Eurasia is uninhabitable. But hey, without the radio and transmission lines, who knows how life managed to survive on the other side of the world? Destroyed most of the known world? Check. Not even the best technology was able to stop it? Check. C’mon, we all know who was responsible for that. This blog got some nice articles on the real locations of the anime and a lot of curious stuff. Just finished the show it was awesome. Nice take on the story! I like your interpretations.